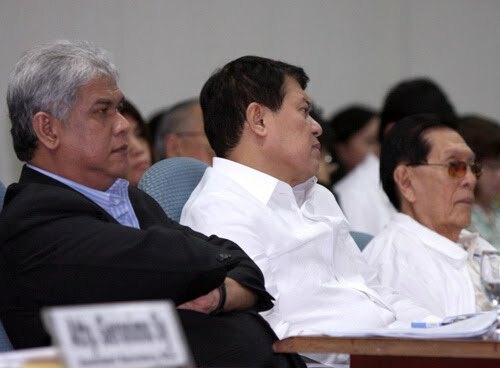 "ANTI-TRUST FORUM: Senate President Juan Ponce Enrile, together with Sen. Manny Villar, chair of the committee on Trade and Commerce, attend the second day of “Understanding Anti-Trust”, a forum presented by the Committees on Trade and Commerce, Economic Affairs and the Special Oversight Committee on Economic Affairs. Also in photo is Senate Deputy Secretary for Legislation, Atty. Edwin B. Bellen. (PRIB Photo by Albert Calvelo/10 Feb 2011) "
(Original photo release with text appears here). *Resource speakers for the Senate anti-trust public forum were Usec Zenaida Malaya of the Department of Trade and Industry, Atty. Anthony Abad, and Atty. Lorna Patajo-Kapunan.